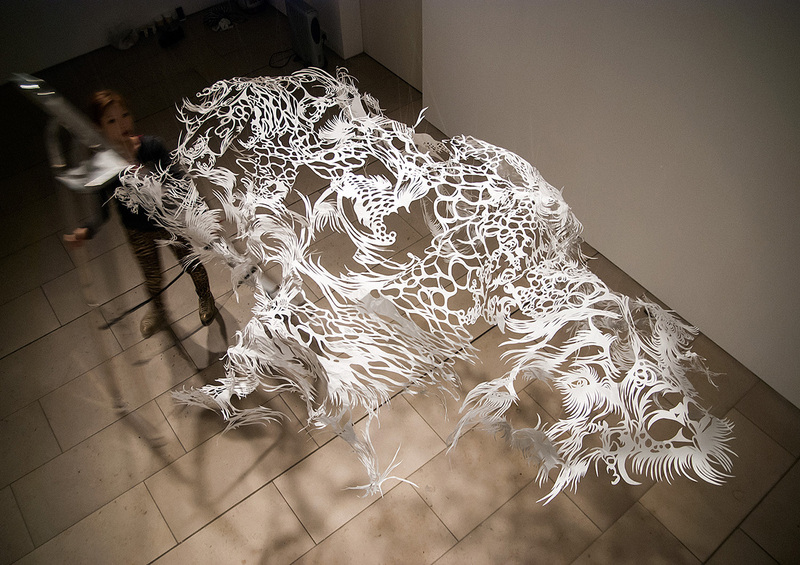 Naho's latest major handmade Paper Cut Sculpture unveiling at ArtPrize'14, Michigan: Cut from one 3mx3m sheet of Japanese Washi Paper. 65 backers pledged £10,201 to help bring this project to life. , Planning and Production costs. 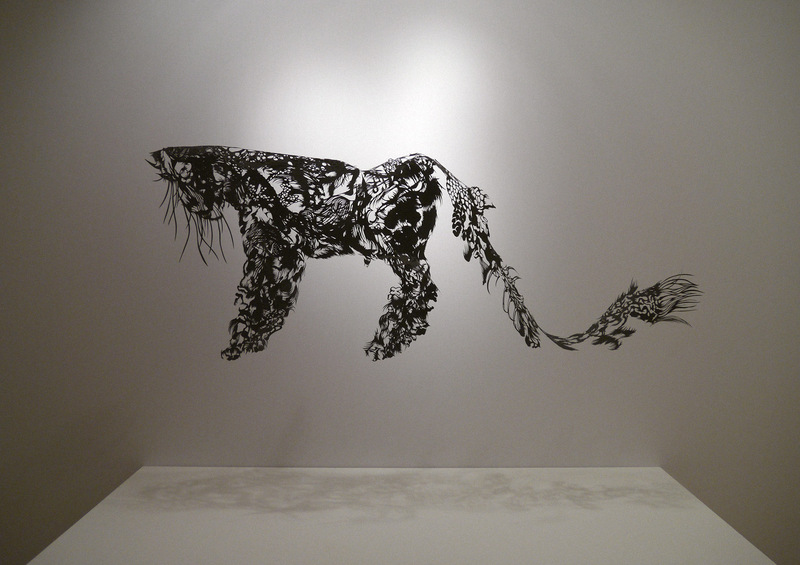 Our wider mission is to enrich the World with a new genre of Contemporary Paper Cut Sculpture. Naho is at the forefront of her discipline pioneering techniques in taking traditional Japanese Kiri-e and propelling it into the contemporary sphere and constantly striving to find new and exciting ways to keep it relevant by creating original art installations, creating films, collaborating and educating through workshops and open studio events. It is often a thankless pursuit but then why does anyone continue making Art? With your support you can create a World where there are more professionals dedicated to bringing smiles on the faces of millions. Note – If you wish to get more than one reward then just select one, pledge the sum of both and message me to explain what you wanted. You can mix and match any Giclée in any reward. That's a fancy French word but we really have to use it because the prints are pretty fancy. 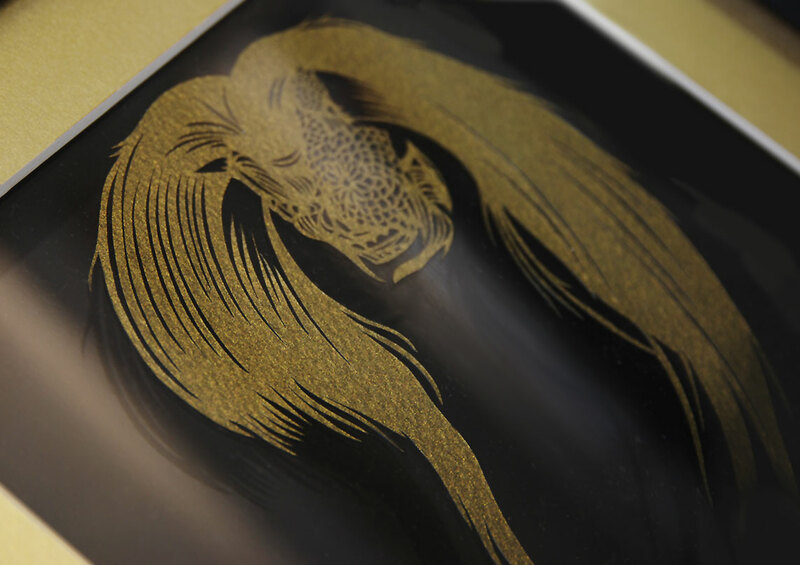 We use a supplier that is using archival quality stock (paper) and pigment based inks instead of dye-based like ink jets.These inks and this thick matte stock, including the shockingly expensive printing machines with ultra fine print heads (totally different to even the best home ink jets) create a print that is crystal clear and lasts hundreds of years. They even use more than double the number of inks in normal home printers creating a richness in colour and black depth that even high end mac displays can't show. To cut a long story short – you'll love them. 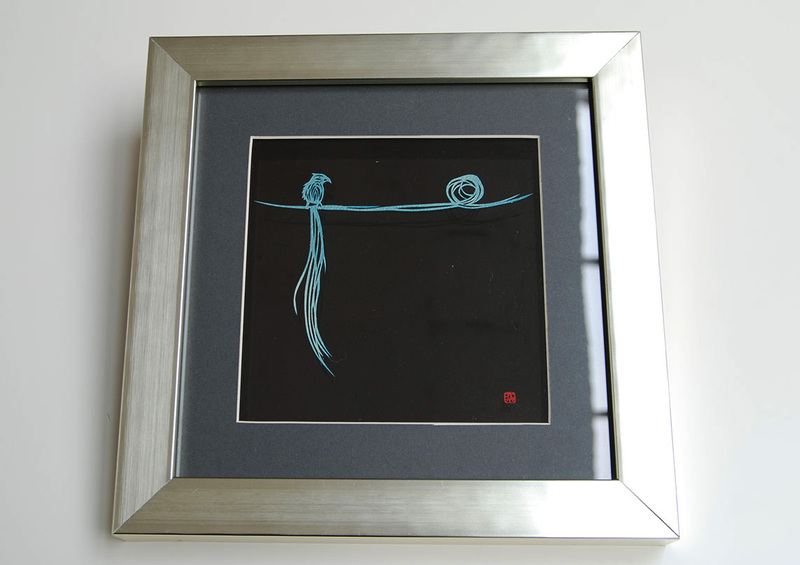 For the really special rewards we are giving away 9 of the original one-off handmade cavity-framed Paper Cuts from Naho's Kiku Flowers Collection to 9 people. 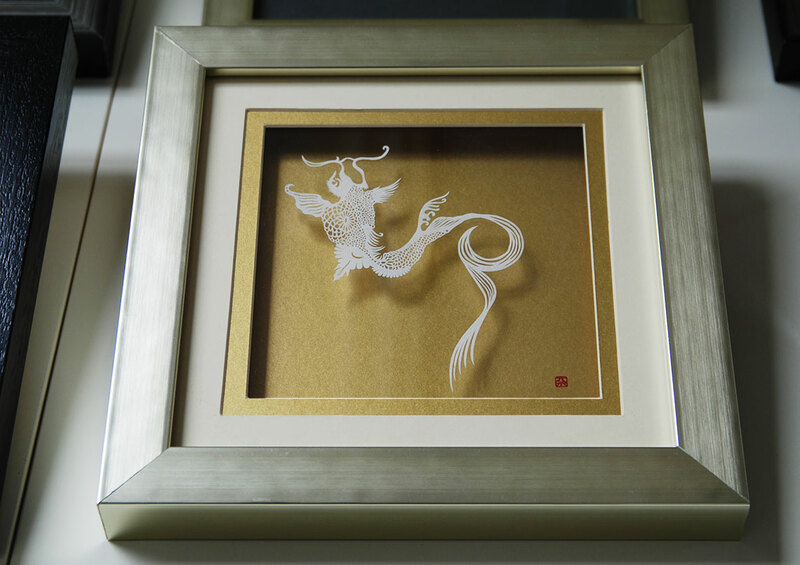 Originally a Series of 10 Original handmade Papercuts, they all feature different body and texture of Japanese paper carefully chosen to enhance the character of each piece. The theme is that of the Kiku Flower intertwined with potent Japanese symbols such as the Crane, Carp and Kabuki theatre. 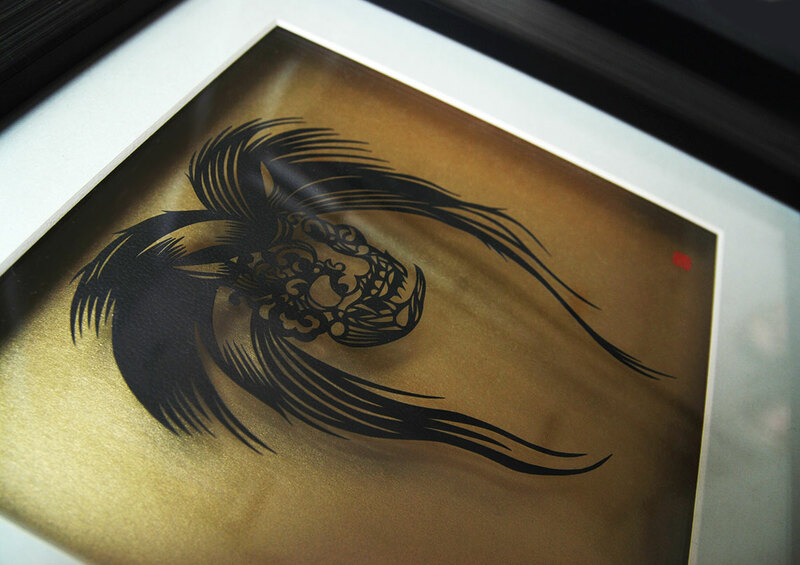 Also included are 6 paper cut designs, three Giclée, an Associate Producer credit in the upcoming short film, and a secret Giclée print of Nahoko Kojima's new major piece which is yet to be unveiled in Michigan in Sep 2014. Solo Kojima is producing the show in Michigan, Nahoko Kojima and her business partner Shari Solo. We are in a legal agreement with the Gerald R. Ford Presidential Museum to show these three pieces in all their glory freely to the public for the duration of Artprize. Last year the museum saw the largest footfall of any venue in Michigan with almost 230,000 people enjoying the free shows. The production of the pieces is entirely in-house after the delivery of the stock from the Papermill in Japan. Our supplier is 100% reliable and so are we, based on our track record of producing international shows at venues as prestigious as the Saatchi Gallery in London to Paris and Milan. This is our first show in the US and we are committed to making it the most groundbreaking event in our genre of Contemporary Paper Cut Sculpture. Having said all this, the work is so fragile, always made from just one sheet of paper, that it can only be handled by a handful of professionals when hanging the sculptures. This clearly has a risk associated with it which no amount of insurance is going to alleviate. It's simply the nature of the beast, and also one of the reasons why Naho often focusses on endangered species, highlighting their strength of presence in the face of their noble fragility in this world of ours. DESKTOP ICON SET // Shiny new set of nine high quality unreleased Nahoko Kojima icons for Mac/PC as a token of our appreciation. They include simple instructions on using them instead of the boring folder icons. 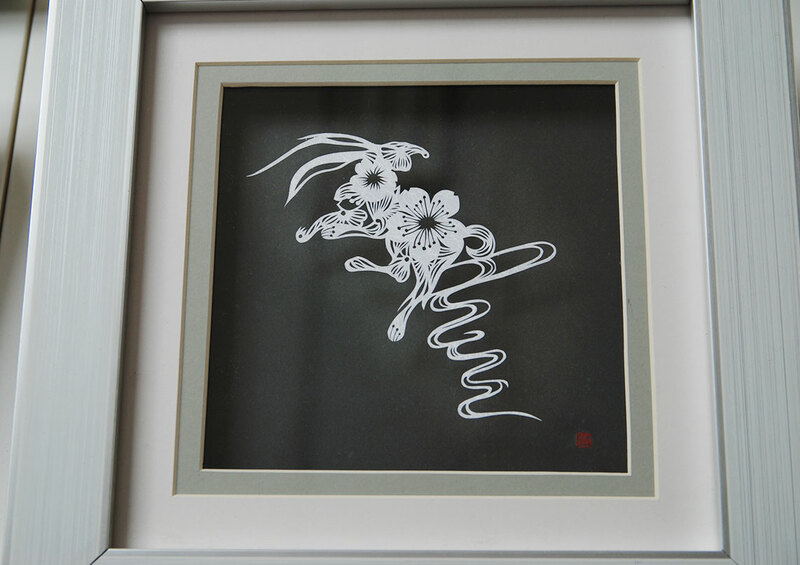 ONE SIGNED GICLÉE OF YOUR CHOICE // Archival quality Paper Cut Sculpture print signed by the artist, Nahoko Kojima. 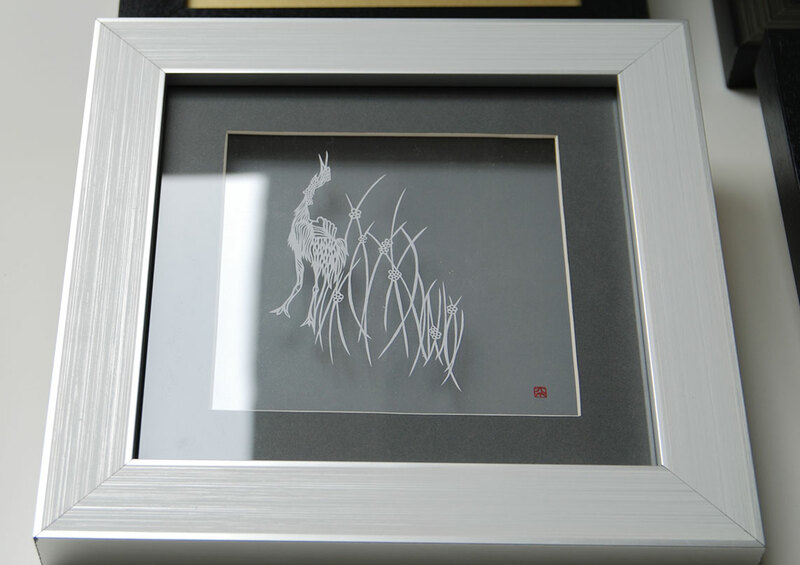 TWO SIGNED GICLÉE OF YOUR CHOICE // Archival quality Paper Cut Sculpture prints signed by the artist, Nahoko Kojima. CLOUD LEOPARD SET // Mini encapsulated offcuts from Cloud Leopard Paper Cut Sculpture and one signed Giclée of the iconic piece. 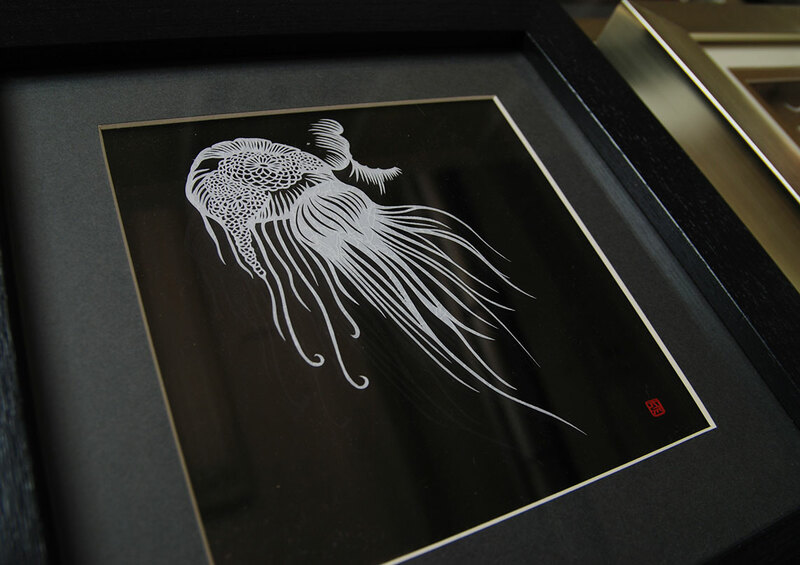 THREE SIGNED GICLÉE OF YOUR CHOICE // Archival quality Paper Cut Sculpture prints signed by the artist, Nahoko Kojima (Triple Byaku Giclée counts as 3). You will get a chance to mix and match what you want afterwards. BYAKU POLAR BEAR SET // Mini encapsulated Washi offcuts from Byaku, credits in our next short film coinciding with the launch of the new piece and all four Byaku Giclée. ORIGINAL ART SET: SWEETS // Same as the Artist Set but with the addition of the 'Sweets' original a4 framed Paper Cut pieces, cut by hand by the artist. Naho never cuts the same thing twice so this reward is only for one person. ORIGINAL ART SET: KIKUITADAKI // Same as the Artist Set but with the addition of the 'Kikuitadaki' (Goldcrest) original a4 framed Paper Cut piece, cut by hand by the artist. Naho never cuts the same thing twice so this reward is only for one person. 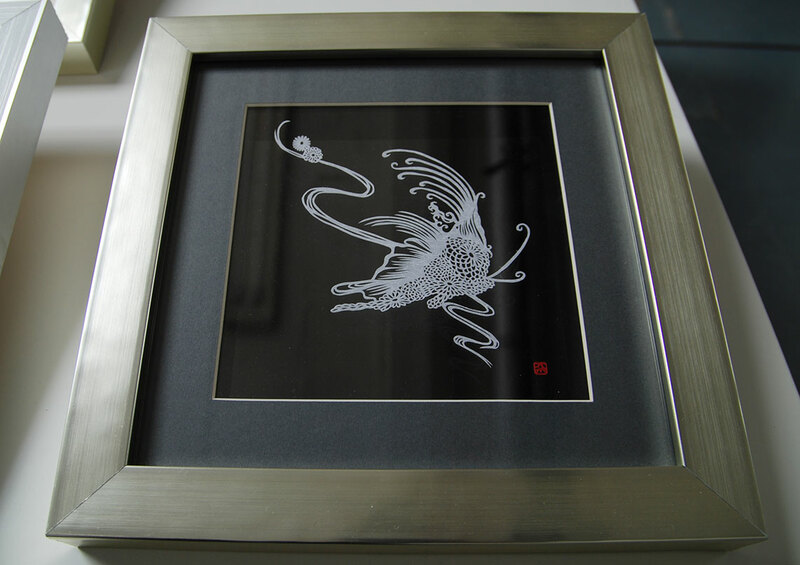 ORIGINAL ART SET: KOI TO SAKURA // Same as the Artist Set but with the addition of the 'Koi to Sakura' (Carp and Cherry Blossom) original a4 framed Paper Cut piece, cut by hand by the artist. Naho never cuts the same thing twice so this reward is only for one person. ORIGINAL ART SET LADYBIRD // Same as the Artist Set but with the addition of the 'Ladybird' original a4 framed Paper Cut piece, cut by hand by the artist. Naho never cuts the same thing twice so this reward is only for one person. ORIGINAL FLOWER VASE // One of the unique one-off handmade Paper Cut pieces from Naho's Flower Vases Collection. They are all different and there are only 14 left to give away. This pledge includes six of Naho's designs to cut, any two Giclée and a special thanks credit in the upcoming short film. 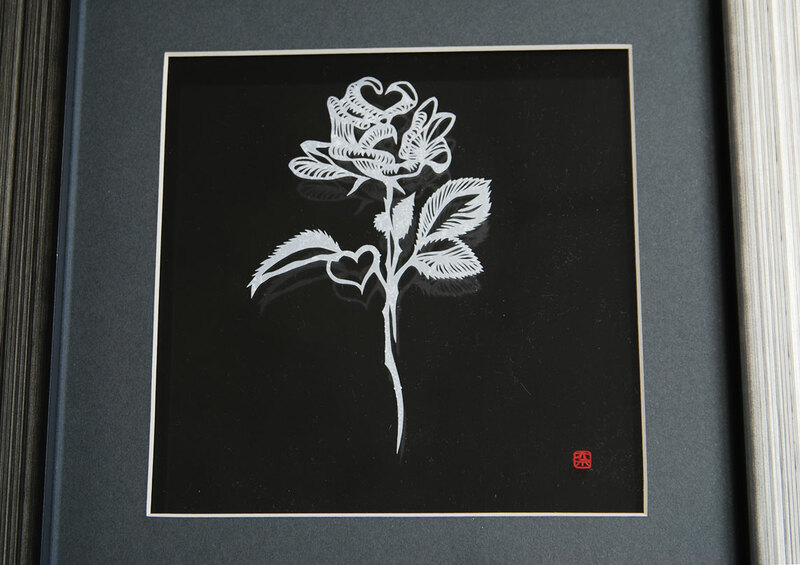 ROSE PATRON SET // 6 Designs to cut, with three signed giclée and one of the 10 original one-off cavity-framed Paper Cut pieces from Nahoko Kojima's Kiku Flowers Collection (pictured left). As a rare treat you also get a bonus giclée of the new piece to be unveiled in Michigan in September. As this is being kept a complete secret, you will receive your reward only after that show in November. Includes your name in the credits of the upcoming short film linked to this new piece as Associate Producer // Click here to select the ROSE piece. KABUKI PATRON SET // 6 Designs to cut, with three signed giclée and one of the 10 original one-off cavity-framed Paper Cut pieces from Nahoko Kojima's Kiku Flowers Collection (pictured left). As a rare treat you also get a bonus giclée of the new piece to be unveiled in Michigan in September. As this is being kept a complete secret, you will receive your reward only after that show in November. Includes your name in the credits of the upcoming short film linked to this new piece as Associate Producer // Click here to select the KABUKI piece. KABUKI II PATRON SET // 6 Designs to cut, with three signed giclée and one of the 10 original one-off cavity-framed Paper Cut pieces from Nahoko Kojima's Kiku Flowers Collection (pictured left). As a rare treat you also get a bonus giclée of the new piece to be unveiled in Michigan in September. As this is being kept a complete secret, you will receive your reward only after that show in November. Includes your name in the credits of the upcoming short film linked to this new piece as Associate Producer // Click here to select the KABUKI II piece. RABBIT PATRON SET // 6 Designs to cut, with three signed giclée and one of the 10 original one-off cavity-framed Paper Cut pieces from Nahoko Kojima's Kiku Flowers Collection (pictured left). As a rare treat you also get a bonus giclée of the new piece to be unveiled in Michigan in September. As this is being kept a complete secret, you will receive your reward only after that show in November. 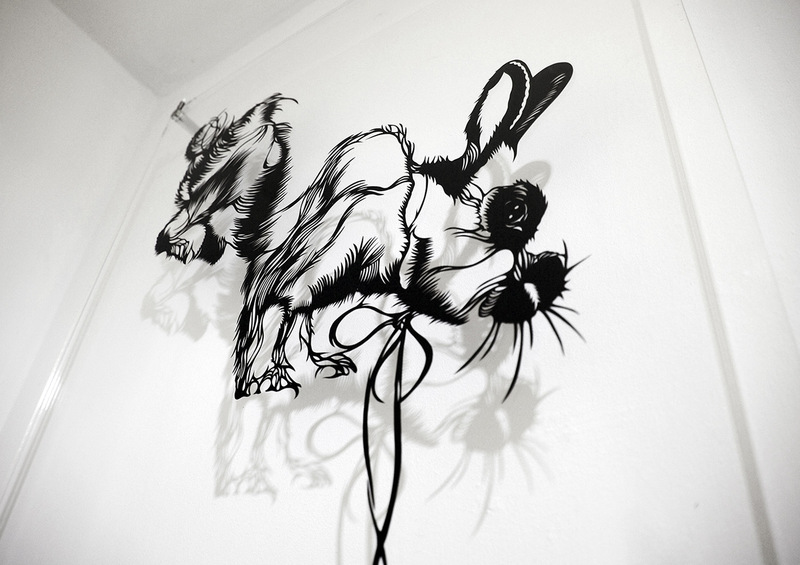 Includes your name in the credits of the upcoming short film linked to this new piece as Associate Producer // Click here to select the RABBIT piece. JELLY FISH PATRON SET // 6 Designs to cut, with three signed giclée and one of the 10 original one-off cavity-framed Paper Cut pieces from Nahoko Kojima's Kiku Flowers Collection (pictured left). As a rare treat you also get a bonus giclée of the new piece to be unveiled in Michigan in September. As this is being kept a complete secret, you will receive your reward only after that show in November. Includes your name in the credits of the upcoming short film linked to this new piece as Associate Producer // Click here to select the JELLY FISH piece. CARP PATRON SET // 6 Designs to cut, with three signed giclée and one of the 10 original one-off cavity-framed Paper Cut pieces from Nahoko Kojima's Kiku Flowers Collection (pictured left). As a rare treat you also get a bonus giclée of the new piece to be unveiled in Michigan in September. As this is being kept a complete secret, you will receive your reward only after that show in November. Includes your name in the credits of the upcoming short film linked to this new piece as Associate Producer // Click here to select the CARP piece. BUTTERFLY PATRON SET // 6 Designs to cut, with three signed giclée and one of the 10 original one-off cavity-framed Paper Cut pieces from Nahoko Kojima's Kiku Flowers Collection (pictured left). As a rare treat you also get a bonus giclée of the new piece to be unveiled in Michigan in September. As this is being kept a complete secret, you will receive your reward only after that show in November. Includes your name in the credits of the upcoming short film linked to this new piece as Associate Producer // Click here to select the BUTTERFLY piece. SPARROW PATRON SET // 6 Designs to cut, with three signed giclée and one of the 10 original one-off cavity-framed Paper Cut pieces from Nahoko Kojima's Kiku Flowers Collection (pictured left). As a rare treat you also get a bonus giclée of the new piece to be unveiled in Michigan in September. As this is being kept a complete secret, you will receive your reward only after that show in November. Includes your name in the credits of the upcoming short film linked to this new piece as Associate Producer // Click here to select the SPARROW piece. CRANE PATRON SET // 6 Designs to cut, with three signed giclée and one of the 10 original one-off cavity-framed Paper Cut pieces from Nahoko Kojima's Kiku Flowers Collection (pictured left). As a rare treat you also get a bonus giclée of the new piece to be unveiled in Michigan in September. As this is being kept a complete secret, you will receive your reward only after that show in November. Includes your name in the credits of the upcoming short film linked to this new piece as Associate Producer // Click here to select the CRANE piece.